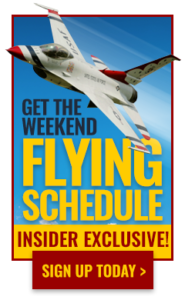 The 2018 Thunder of Niagara International Air Show will feature one of the most spectacular displays of aviation innovation, history, and military air-power strength in North America. This year’s air show will be highlighted by not one, but two formation military jet demonstration teams. They are the world-famous United States Air Force Thunderbirds and iconic Canadian Forces Snowbirds. Both teams will highlight precision formation aerobatics at speeds approaching the sound barrier and as close to 36 inches apart. The air show is open to the public at no charge and includes free parking and shuttle bus service. Niagara Air Show spectator counts are expected to reach as high as 100,000, in some cases more than 100,000 people for the weekend. In addition to two elite formation military jet demonstration teams, the show will feature some of the best military and civilian demonstration pilots in the world. 2018 marks the first debut of the U.S. Air Force F-22 Raptor demonstration at Niagara’s Air Show. The Raptor’s jaw-dropping demonstration highlights the U.S. Air Force’s fifth-generation fighter capabilities that are second to none. The F-22 is as big as a tennis court yet can maneuver in ways that leave the public scratching their heads. Not to be out outdone, the United States Navy is sending their F/A-18 “Super Hornet” Demonstration from Strike Fighter Squadron 106, known as the “Gladiators.” All five branches of the U.S. military are represented with airpower and participation at this year’s Thunder of Niagara International Air Show. The air show’s spectacular highlights are not just limited to the air. Niagara’s ground displays feature over 45 aircraft, spanning 75+ years of flight. Ground display highlights include the mammoth C-5 Galaxy, B-52 Stratofortress, and take spectators back in time with the iconic P-51 Mustang and locally built P-40 Warhawk. It is an excellent opportunity for the public to get up close and meet the men and women who fly and maintain these majestic aircraft. The Niagara Falls Air Reserve Station along with civilian partner NIMAC combine efforts to bring you the Thunder of Niagara Air Show. The Niagara Falls Air Reserve Station is the last U.S. Air Force Installation in the State of New York and the largest federal facility in the region. The station is home to the 914th Air Refueling Wing and the 107th Attack Wing. The Niagara Falls Air Reserve Station also houses the 2nd Squadron 101 Calvary, 865th Combat Support Hospital, 1982 Forward Surgical Team, 277th Quartermasters Corp and the Buffalo Military Entrance Processing Station. In 2005, NIMAC led the charge to rally community support against the Department of Defense recommendation to close the Niagara Falls Air Reserve Station, collecting over 126,300 letters for the BRAC Commission, the most collected for any base in the nation. Their efforts were rewarded in August 2005, when the BRAC Commission voted to remove the Niagara Falls Air Base from the list of recommended base closures.